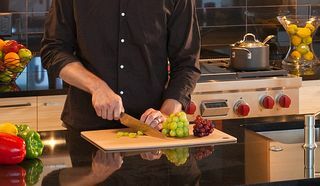 Twelve years ago, I wrote an article comparing plastic and wood cutting boards which may be why one of the most frequent questions that I get is what cutting board do I use in my personal life. 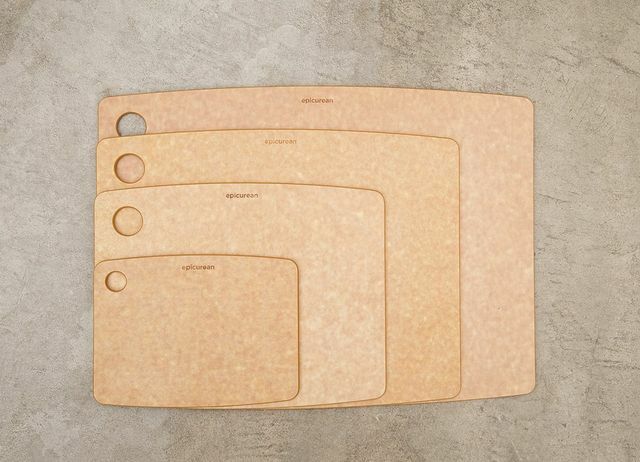 For the last six years, I have been using cutting boards made by Epicurean Cutting Surfaces and my wooden cutting boards haven't come out of storage for years. Here's why I like the Epicurean boards. 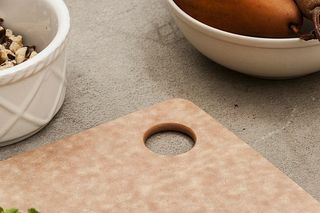 The wood fibers are layered and pressed into a food-safe resin which makes the board pretty dense and surprisingly heavy (the 14.5-in by 11.25-in board is about 1.5 pounds). After over six years of use, all my boards (which I purchased from Bed Bath & Beyond and Amazon.com) are still as flat as when I bought them. Not having to worry about warping (or oiling the board to keep them from cracking) makes using a wood board a lot easier. 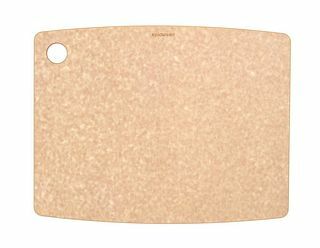 Epicurean cutting boards are dishwasher safe. In fact, they were specifically designed to fit most dishwashers. Even if you plan on hand washing the boards (which is what we do most of the time using just soap and water), I do recommend washing a brand new board in a dishwasher at least once. Sometimes a new board will have a smell from the food-safe wood glue used to to bind the wood fibers which I have found goes away after machine washing. I have four boards. The largest one I have is a natural color 17.5-in by 13-in, and it works very well when I need to prepare a lot of ingredients or break down a chicken (or anything else that I prefer to have some more board space when working). 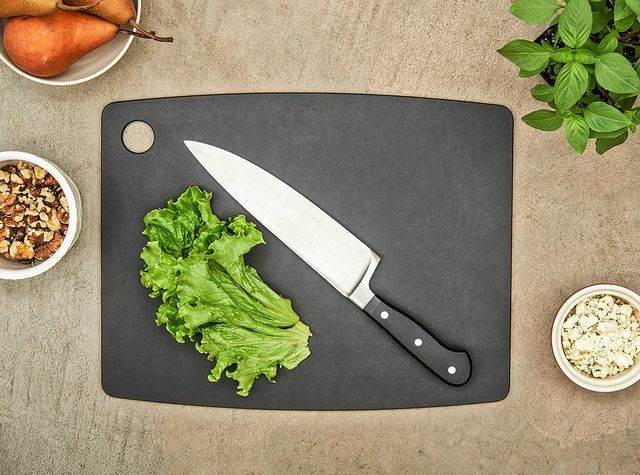 I have both a natural and a slate colored 14.5-in by 11.25-in which get used more than any other cutting board (which is why I have two of them). 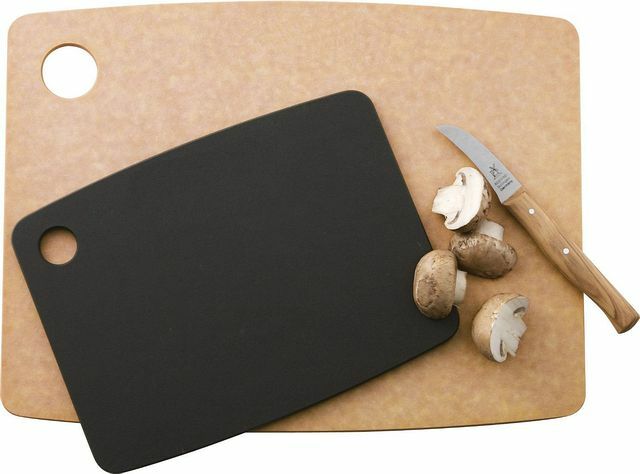 In addition to the 14.5-in by 11.25-in and 17.5-in by 13-in boards, I purchased a small cutting board (8-in by 6-in) about five years ago. I found that I wanted a smaller cutting board to use to cut small amounts of ingredients without dirtying a large cutting board. I reach for this one whenever I need to cut a lime, mince a few cloves of garlic, or slice a couple mushrooms. They have a fourth size that is larger than the smallest board I own and measures in at 11.5-in by 9-in. 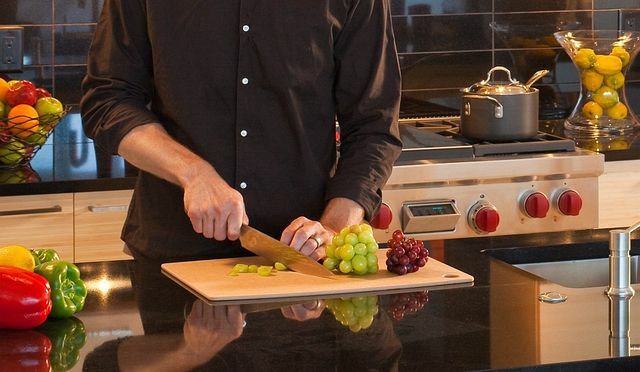 Something else nice about the cutting boards is that they can handle fairly high heat (up to 350°F) which means I don't have to reach for a trivet if I need to put a hot pot down on the counter and my board is already there. 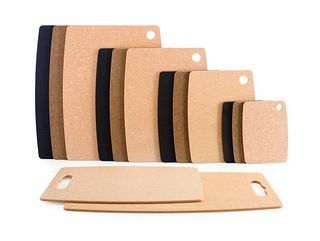 I've found that these boards have worked really well for me and the number of years which I have used them without having to take any special care (I just wash them and dry them - no salt rubs, vinegar, or oiling) means that I recommend them without reservation. 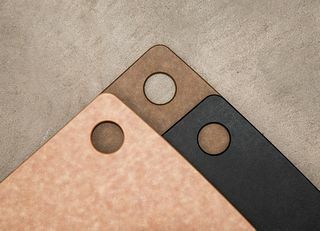 The boards are available in three colors: Natural, Nutmeg, and Slate. 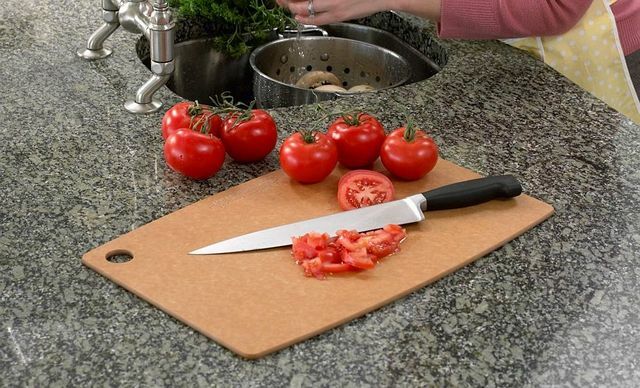 I prefer the natural color when any heavy chopping or cutting is needed and would recommend getting a natural color board if you are only buying one. This is because, like all wood boards, over time small amount of wood fiber will come off the board. 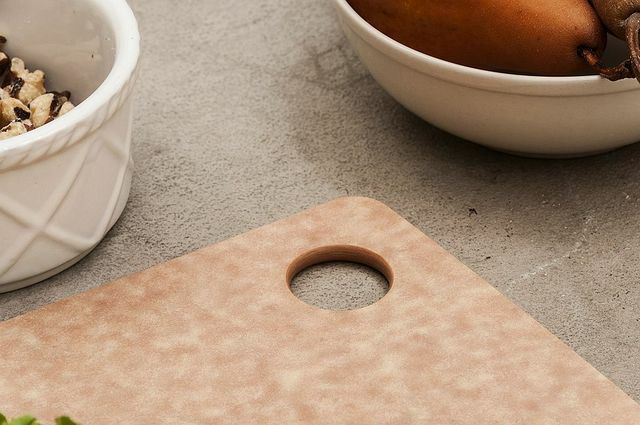 This is usually not noticable because wood boards tend to be light in color and the specks are very small, but a tiny speck of black board fiber can be easily noticed depending on the food being prepared. - Do you know if they are harder on knives than normal wood? I have touched som boards in a store, and had the feeling that they are much harder. They also contain a lot of glue, to my understanding, that some say is harsh on the edge of the knife. - Have your tried the black ones? They have another composition, I think. 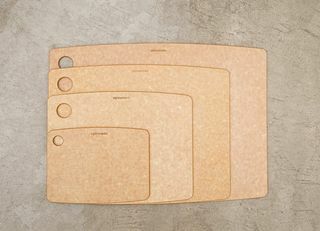 - It seems, a big brand is TopChef, making optical identical boards, somewhat cheaper. Have your tried them? - Do you know if they have the same anti-bacterial properties as wood? This is the main reason I use wood for chicken and meat. I own both black and natural (two boards of each). They might have different composition, but I have not noticed a significant difference between the boards. I really can't say if one is softer than the other from my experience. I have not had an opportunity to try similar boards from TopChef. I do not know for sure, but they do seem to clean easily and once dry do not appear to harbor any bacteria. 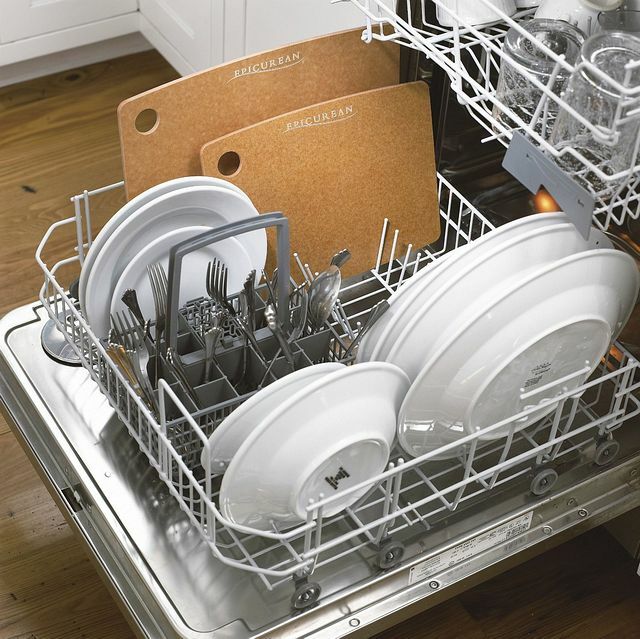 They do have the added benefit that you can run them in a dishwasher which will usually be sufficient to sanitize the board if there is any doubt. I am a stickler for food safety in my house and have used my boards (except the small one) on meat and poultry for years now without incident. I don't know if this is useful information or not to you, but these boards are NSF certified.